Ease of assembly in tight spaces where wrenches might not have clearance if installing traditional fittings, and they are more easily assembled with moderate torque. Hard to reach areas where flexibility is required, eliminating the need for adapters in the tube, pipe or hose line. Large hose, tube or pipe connections where shock, vibration, high pressure and/or pressure surges are present, which could more easily damage a traditional large hydraulic fitting. Making connections that allow for easy maintenance in rigid lines such as continuous pipes or metal tubes. 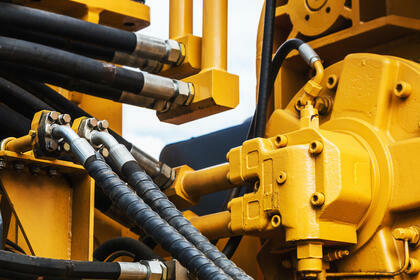 Reducing the chance of components becoming loose in rigorous hydraulic applications. Using flange connections in these larger size, high pressure circumstances allows for easier assembly over using large fittings. The flange’s zero-clearance assembly, ease of disconnecting and reconnecting for maintenance of hose, tube and manifold connections, can be much faster and provide the ability for more accurate torque of the bolts as opposed to trying to achieve the proper torque of a large fitting. Flange and flange fitting connections are much less likely to loosen compared to a standard hydraulic fitting when there is proper load distribution of clamping around the flange head. Think of it like bolting the wheel of your car onto the hub or brake drum disk. If you don’t tighten the lug nuts in a star pattern the wheel will not tighten evenly, which can cause warping of the brake disc, rotor or brake drum. Flange connections are also the best option for hose end connections that have bends and are subjected to very high lateral forces that are inclined to cause loosening of the assembly. Mistakes to Avoid With Flanges Why Flange Fittings?